Here are some of the major impacts The Alfalfa Project will produce. Each impact is based on a $1 million capital investment. Some simple math will illustrate the dramatic increases $400 million in capital investment — our project goal—will provide. For each $1 million in capital committed to The Alfalfa Project, approximately 588 acres of alfalfa can be converted to Precision Alfalfa Management by covering all the technology and capital expenses required. To see the effect of $400 million in project capital, multiply 588 acres by 400 and that indicates 235,200 acres could be converted. For each $1 million in capital committed to The Alfalfa Project approximately, 761,863,670 gallons of water would be saved annually on farms in the San Joaquin Valley of California. To see the effect of $400 million in project capital, multiply 761,863,670 gallons by 400 and that indicates 304,745,467,804,500 gallons of water would be saved annually on farms in the San Joaquin Valley of California. Carbon sequestration is a natural process through which carbon dioxide (CO2) from the atmosphere is captured and stored in the earth for extended periods of time. 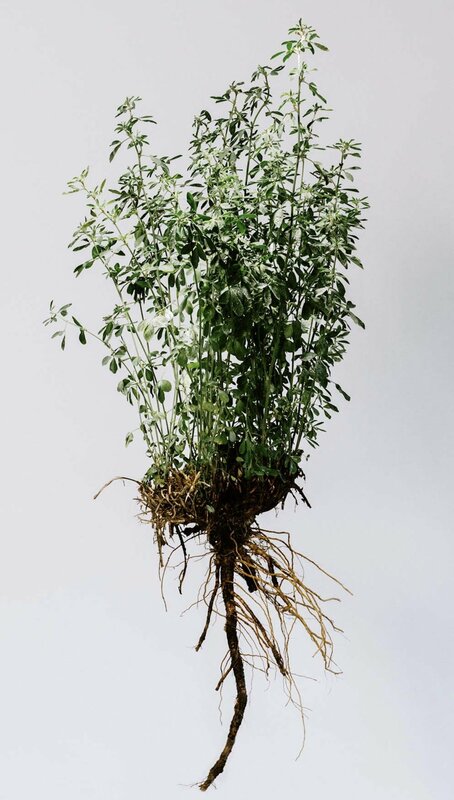 Alfalfa can have a root structure that reaches 10-15 feet into the ground, and studies have found alfalfa to sequester very high amounts of carbon in its root structure through its natural growth and maturation processes. Due to the depth of this root structure, the roots are never disturbed as crops rotate. Additionally, alfalfa is a member of the legume family important for carbon sequestration, and it typically stays in the ground for as many as 7 years while undergoing repeated cuts during the growing season. For each $1 million in capital committed to The Alfalfa Project it has been estimated that approximately 1,998 MTCO2e (metric tons carbon dioxide-estimated) would be sequestered annually on these farms in the San Joaquin Valley of California. To see the effect of $400 million in committed capital, multiply 1,998 MTCO2e by 400 and that indicates 799,200 MTCO2e would be sequestered annually on farms in the San Joaquin Valley of California. For each $1 million in capital committed to The Alfalfa Project it has been estimated that approximately 3,449 additional tons of alfalfa would be grown in the San Joaquin Valley of California. To see the effect of $400 million in project capital, multiply 3,449 tons by 400 and that indicates 1,379,600 additional tonnage of alfalfa would be grown annually in the San Joaquin Valley of California. For each $1 million in capital committed to The Alfalfa Project it has been estimated that approximately 3,635 metric tons of oxygen would be generated in the San Joaquin Valley of California. To see the effect of $400 million in committed capital, multiply 3,635 metric tons by 400 and that indicates 1,454,000 metric tons of oxygen would be generated annually in the San Joaquin Valley of California. For each $1 million in capital committed to The Alfalfa Project it has been estimated that over $1,880,000 would be spent in the San Joaquin Valley of California installing subsurface drip irrigation systems that would increase grower revenues, increase spending within the San Joaquin Valley based on increased revenues, generate new jobs and create additional tax revenues for California. To see the effect of $400 million in project capital, multiply $1,880,000 by 400 and that indicates over $752,000,000 million dollars would be spent in the next 3 years in the San Joaquin Valley of California. This will have a substantial impact on the greater farmer community, generating new revenues, new jobs, and reducing poverty in the San Joaquin Valley of California. This will also help prevent a farmer exodus from California due to restricted water supplies and new legislation. It will also make the dairy supply chain sustainable.